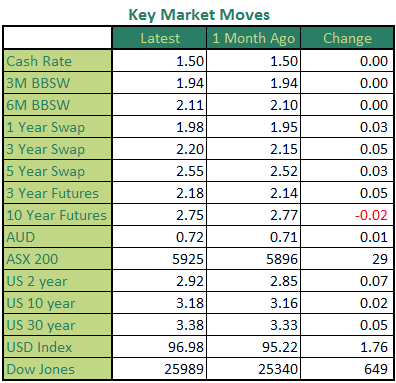 The RBA left the cash rate on hold again in November and then upgraded their forecasts in the subsequent quarterly Statement on Monetary Policy. However to achieve their forecasts the RBA require a number of assumptions around wages and the savings rate to materialise. The latest data on the housing market points to a further deterioration in the housing market over the months ahead. The biggest question that lies ahead might not be ‘when’ the RBA will hike the cash rate. The RBA left the cash rate on hold again in November with the cash rate remaining at 1.50% since August 2016, a new record for stability. Stronger than expected outcomes for growth and employment have seen the RBA upgrade their forecasts in their latest Statement on Monetary Policy. They continue to acknowledge that consumption poses the biggest risk to their outlook. Short end pressure in funding markets has stabilised over the past month with 3 and 6 month BBSW little changed. The Australian Dollar has had a reprieve and largely moved sideways over the past month after failing to break through 0.70. The US FOMC once again pointed to further rate hikes again at their most recent meeting. The FOMC is widely expected to lift rates again in December with two more in early 2019 likely to follow. The RBA in the latest quarterly Statement on Monetary Policy upgraded their key forecasts after some better than expected outcomes since their last set of forecasts in August. The stronger than expected Q2 GDP figures and the sharp drop in the unemployment rate saw both measures adjusted in the latest set of forecasts. With the growth and unemployment outlooks upgraded, there was a natural flow on effect to expectations around wage growth and inflation. With growth expected to be a little stronger and unemployment expected to be a little lower, subsequently wage growth and inflation should be a little higher. All of these expectations dovetail nicely to form the RBA’s central outlook. 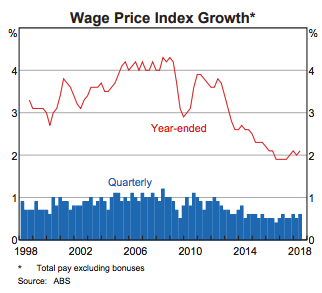 The reason why consumption poses the biggest risk to the RBA’s outlook is so much is riding on wage growth. If we look at the international experience since the GFC, wage growth has proved stubborn despite unemployment rates in many countries falling below what was previously considered full employment or NAIRU (non-accelerating inflation rate of unemployment). 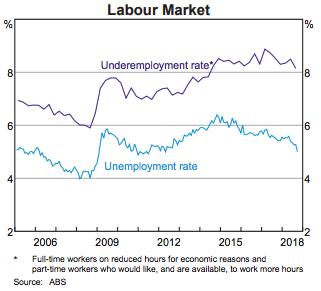 Current trends within the Australian employment market don’t exactly point to a sustained pick up in wage growth in the near term. For some time now, total employment has been growing quicker than the total aggregate hours worked. That has resulted in a growing gap between the unemployment rate and underemployment rate. What that means is that we have more people working but they aren’t working as many hours as what they would like. This creates slack in the labour force. With ample slack in the labour force, employers face little pressure to lift wages to compete for workers given many existing employees are keen to work extra hours anyway. So there is a great deal of uncertainty that wages growth will increase up to the level of the annual rate of consumption, or 3% from its current level of just above 2%. That is, the RBA is also aware that falling house prices and the subsequent impact of falling household wealth could have a negative impact on consumption. 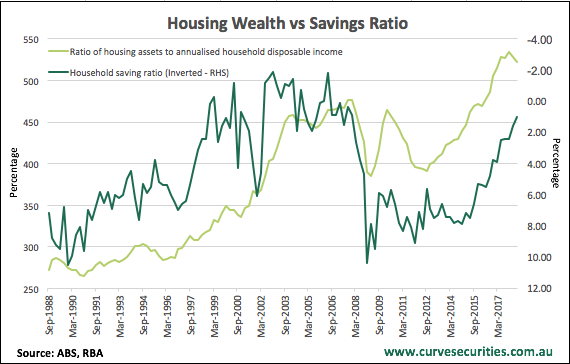 Looking at the directional relationship between housing wealth as a percentage of disposable income and savings ratio over time, we can see that when housing assets, or house prices fall, consumers tend to save more. 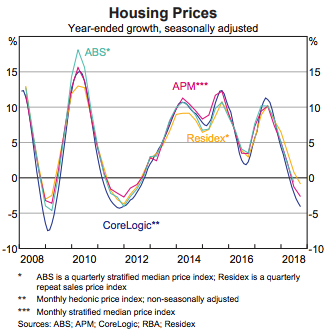 If the same directional relationship holds true as we saw when house prices fell in 2008 and again in 2011, then the savings ratio will actually rise, not plateau over the forecast period as the RBA expects, should house prices keep falling. So with considerable uncertainty around wage growth, the savings rate and thus consumption, the RBA’s outlook for the economy looks optimistic. The upgrade to the RBA’s forecasts in their latest quarterly Statement on Monetary Policy points to the next move in the cash rate as being up. Rather than using that terminology as they had done previously, they now say that if progress is made in ensuring inflation is consistent with the target, “higher interest rates are likely to be appropriate at some point”. Current market pricing suggests that the RBA’s “some point” won’t eventuate before the middle of 2020. If we delve deeper into the downside risks to the RBA’s outlook, that might even prove optimistic. If we look at previous RBA forecasts for wage growth, the key ingredient required to underpin a sustained lift in inflation back towards the RBA’s target, has proved very difficult to forecast. 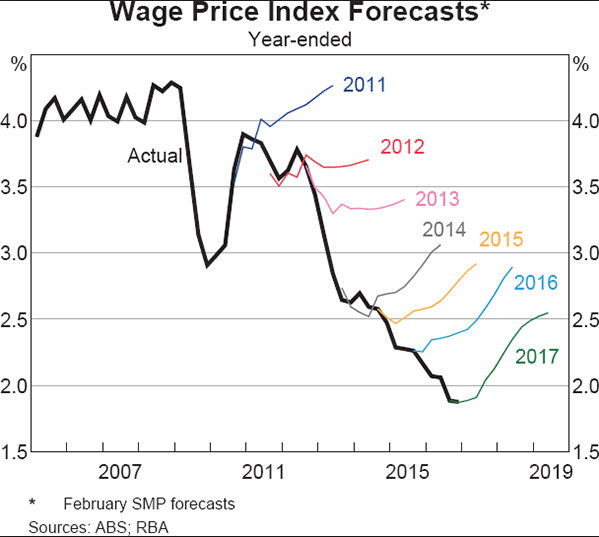 Wage growth has consistently undershot the RBA’s forecasts for the past 7 years. Persistently weak wage growth has seen headline inflation undershoot the lower band of the RBA’s target range for the past 4 years and core inflation has undershot for the past 3 years. While wage growth and the need for it to underpin consumption growth poses a risk to the outlook, it isn’t the biggest risk. 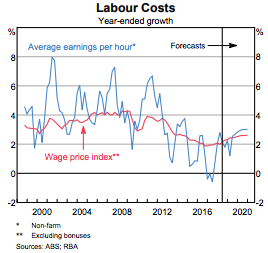 The RBA could actually get wage growth but still not see inflation rise back towards the target on a sustained basis. 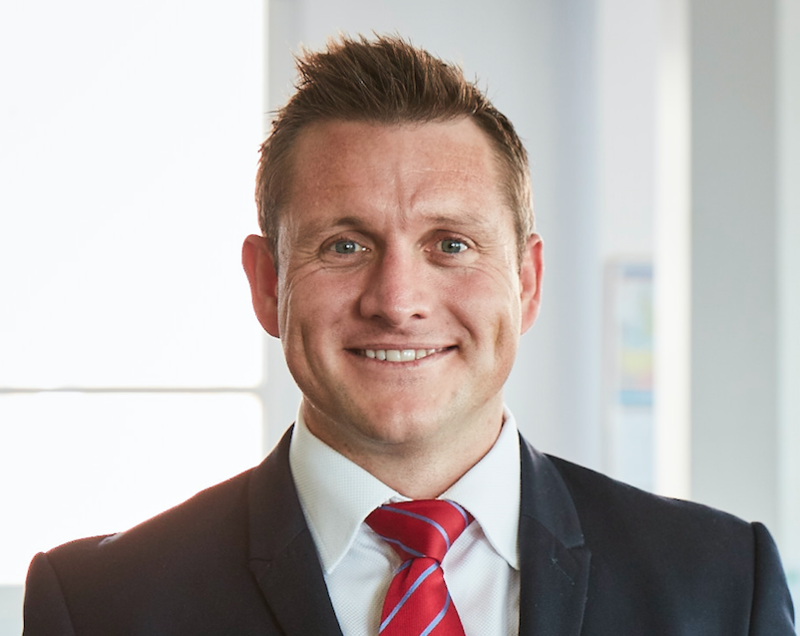 The biggest risk to the outlook at present is the deterioration in the housing market and the second round effects that could have a profound impact on the economy. 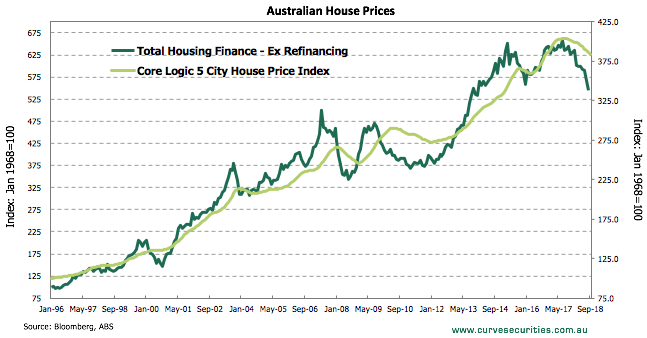 There are a number of ways that housing can impact the broader economy as prices fall. The historical directional relationship between the savings rate and housing wealth suggest households are likely to save more and spend less as their wealth falls. This would see money diverted from consumption towards saving or paying down debt. We get the latest data on the savings rate in the Q3 GDP numbers due early next month. Consumption still makes up around two thirds of the economy, so any pull back in household spending will have a significant impact on growth. We are also seeing signs that construction activity and employment demand from the construction industry is falling. The most recent data on the housing market suggest the trend of falling prices is set to continue. New credit approvals have completely collapsed the past two months. 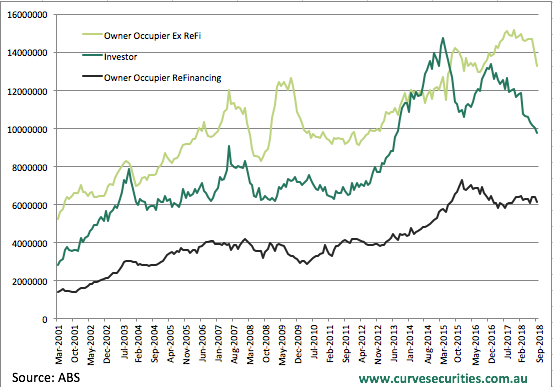 Importantly the decline in investor credit is now being matched by a pull back by owner occupiers. The spring selling season has also underwhelmed with auction clearance rates also continuing to fall. While the price decline in the housing market has so far remained orderly, the further prices fall, the bigger the risk that the fallout from lower prices feeds through to the broader economy. The two key metrics to watch for signs that the deterioration in the housing market could derail the RBA’s outlook is consumption and employment. 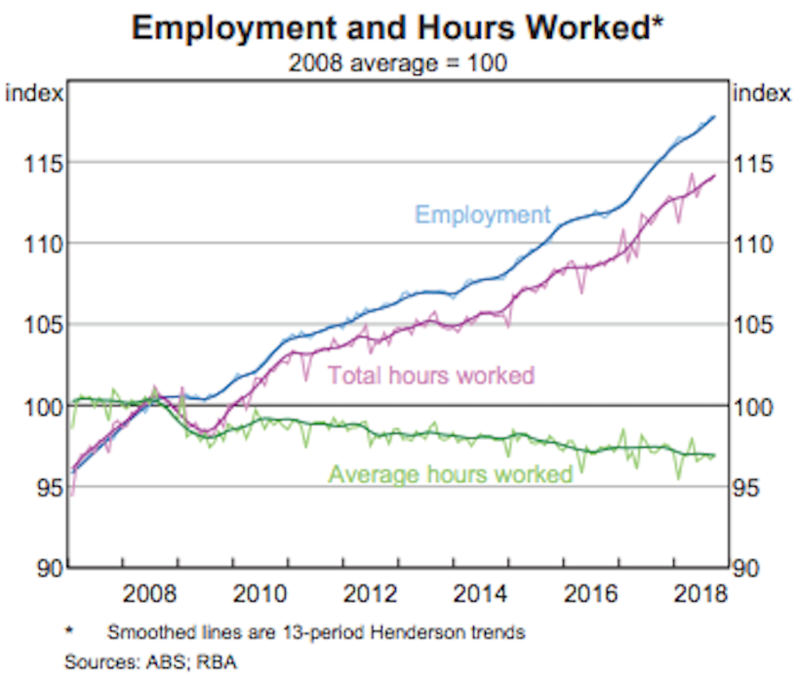 Any sign that consumption growth is slowing or unemployment is rising, will put pressure back on the RBA. 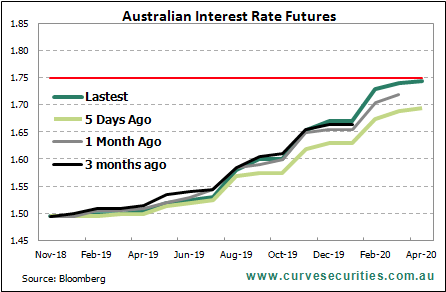 As a result, the question we might need to be asking over the months ahead is not ‘when’ is the RBA going to hike the cash rate but ‘if’ they can lift the cash rate in the face of a deteriorating outlook. Growth remained strong for the second straight quarter with the economy growing 0.9%. Upward revisions to the prior three quarters helped lift the annual rate to 3.4%. CPI was a little softer than expected in Q3 with headline inflation rising 0.4% while core inflation rose 0.35%. The annual rate of headline inflation fell back below the RBA’s target band at 1.9%, while the core annual rate slid to 1.75%. The Employment data continues to post interesting outcomes. Despite total employment growth of only 5,000 new jobs in September the unemployment rate tumbled 0.3% to 5% thanks to a 0.3% fall in the participation rate. The underlying trend is still ok but forward indicators are starting to diverge. After three big falls the past four months, the ANZ job ads stabilised in October with a rise of 0.2%. Jobs ads are still higher than a year ago but it suggests slower growth ahead. Business confidence and Business conditions both continue to drift lower with the slip in condition consistent with what we have seen in the AiG PMI data of late. Despite the decline of late, conditions are still above the long run average. The employment index fell from 11 to 7 and while still strong, needs to be watched closely as further falls could seem employment growth slow. After back to back declines Consumer confidence consolidated in October with the index rising 1% to 101.5. Optimists still outweigh pessimists by a small margin but continued falling house prices and market volatility will likely weigh on confidence going forward. Retail sales missed estimates in September, positing a rise of 0.2%. It capped off a softer quarter for retail sales with total sales ex-inflation rising 0.2% in Q3 after rising 1.2% the previous quarter. Housing finance has completely capitulated the past two months. Owner occupier finance fell 3.89% in August and 4.24% in September to be down 7.74% over the year and 12.41% from its peak. Investor finance continues to slide, falling 2.82% to be down 34% from its peak. Australia’s trade balance continues to be a shinning light for the economy with a huge surplus of $3bln in September. However the run of big surpluses has been helped by a plateau in imports which have been unchanged over the past six months. After a sharp fall last month, Building approvals rose 3.3% in September thanks to a small bounce in apartment approvals in Victoria. The trend is still negative for building approvals and the construction PMI has also rolled over suggesting real activity is also now falling.